Ultrasound technicians do much more than monitoring preborn babies: they are involved in evaluating and diagnosing health conditions throughout the lifespan. Also known as diagnostic medical sonographers, these technicians assist doctors and patients in hospitals, medical clinics, and private practices. Because this position requires less time commitment than some other careers in the medical arena, it can be a good avenue for students who want to enter this in-demand field. The following page explains the online program options available to ultrasound tech students. After an online degree in ultrasound tech, graduates have many opportunities to grow and continue learning. They can continue working as a sonographer in a physician’s office or hospital or earn specialized certification to become a leader in their field. Finding an online program requires some research to ensure the program is of the right caliber and offers class sizes small enough that each student can receive the attention they need and deserve. We’ve looked at online programs in ultrasound technology to find the best of 2017. When it was founded in 1968, State Fair Community College enrolled 436 students. Today, SFCC has grown to serve more than 5,000 students from 14-counties in Missouri. Its online associate of science degree program in Diagnostic Medical Sonography allows applicants the choice of a general or cardiac degree track. Programs begin each August with application deadlines the previous March. The 88-credit-hour program can be completed in 22 months. Students can also pursue the degree on campus in Sedalia. Upon completion, graduates are eligible to sit for Missouri certification exams to begin working in their specialization. North Central Missouri College was founded in 1925 in Trenton. Today it serves 1,458 students on campus and through satellite campuses in Bethany and Maryville. NCMC’s 20-month Diagnostic Medical Sonography program is held partly on campus and at the Hillyard Technical Center (HTC) in St. Joseph. Five days per week. Students complete classroom prerequisites and general education requirements at NCMC. Graduates are prepared to take certification examinations in four specialties: Breast Abdomen/Small Parts, Vascular Technology, and OB/GYN. Application deadlines are in February each year. Students with previous college experience can apply for transfer credit. St Philip's College, founded in 1898, is one of the nation’s oldest community colleges. Today it holds designations as a historically Black college and a Hispanic-serving institution. More than 11,000 students attend studies on campus while more than 7,000 are enrolled in online degree programs. The Diagnostic Medical Sonography program is held at the MLK Campus, Center for Health Professionals. The degree takes 22 months to complete, including one summer semester. This general track program focuses on Abdominal, Obstetrical and Gynecological DMS. Graduates are prepared to take the American Registry of Radiologic Technologists examination with a specialty in Sonography. Washburn University, located in Topeka, was established by members of the Congregational Church in 1865. Today, more than 7,500 students pursue programs at the College of Arts and Sciences and schools of Applied Studies, Business, Law, and Nursing. The university’s Diagnostic Medical Sonography Program offers a two- and four-year degree. Specialties are offered in general, vascular, general/vascular, and cardiac fields. Both programs have offered didactic courses in an online format for more than 11 years, with clinical experiences offered in a range of professional settings. Graduates are qualified to sit for appropriate ARDMS or CCI certification examinations. In 1924, the Sisters of Mercy founded Misericordia University, making it the first four-year institution of learning in Luzerne County. Since the 1970s, MU has been a co-educational university and today serves more than 3,000 students on its upper and lower campuses near Wilkes-Barre. The full time Bachelor degree in Diagnostic Medical Sonography is a hybrid program blending on-campus coursework with online studies. Students can sit for the ARRT Sonography exam. Practicing sonographers can elect to complete an Express Diagnostic Medical Sonography Bachelor Degree on a part-time basis. Sonographers with credentials can apply earned credits toward the 125-credit express degree. Founded as a Catholic University in Adrian in 1919, Siena Heights University became a coeducational institution in 1969. Today, as one of the nation’s 18 Dominican Catholic colleges and universities, SHU serves 2,700 students. The Bachelor of Applied Science (BAS) degree in Radiologic Technology program requires applicants to hold an Associate of Applied Science Radiologic Technology degree or a combination of hospital-based training, two years of related work experience, and ARRT registry. The program includes no additional RT training, focusing instead on a curriculum that satisfies bachelor degree general education requirements. Students can also complete the Associate of Applied Science RT degree at SHU’s Adrian and Southfield campuses. Fort Hays State University was established on 200 acres in Hays, KS in 1902. FHSU currently enrolls more than 14,210 campus students, with another 6,000 students pursuing degrees online. The 55-credit-hour core making up the Bachelor of Science Degree in Medical Diagnostic Sonography includes 22 credit-hours of practice experience (12 months) with local clinical affiliates. Coursework is completed in five semesters, including one summer of studies. Specialties include abdomen and superficial structures, musculoskeletal, obstetrics/gynecology, pediatric echocardiography, neurosonography, vascular, ophthalmology, breast, and adult echocardiography. The program is accredited by the Higher Learning Commission of the North Central Association of Colleges and Schools. Established in Omaha in 1891, Nebraska Methodist College serves 1,000 students dedicated to the study of art and science of healthcare. The focus is on service-learning experiences and community-based education affiliated with the Methodist Health System. The 21-month sonography program combines didactic instruction with hands-on clinical training. The 76 credit-hour degree includes the Educated Citizen Core Curriculum. Prerequisites include completion of college algebra, physics (including a lab), psychology, anatomy/physiology, and medical terminology. There are electives in clinical experience and clinical externships. Graduates are prepared to take American Registry of Diagnostic Medical Sonographers (ARDMS) abdomen and obstetrics/gynecology examinations. Oregon Institute of Technology (Oregon Tech) was founded in 1947. Every degree program is based on theory and practice, blending clinics, lab-based classes, and externships in addition to the general-education core. The Diagnostic Medical Sonography baccalaureate program, located at the Klamath Falls campus, is comprised of 192 credits to be completed in four years. The competitive admission program gives preferences to applicants with previous coursework in biology, chemistry and mathematics. Graduates are prepared for certification exams offered through the American Registry of Diagnostic Medical Sonographers (ARDMS). More than six scholarship programs are available to DMS applicants. MCPHS University was founded as the Massachusetts College of Pharmacy in 1823, making it Boston’s oldest institution of higher learning. Today it offers programs through campuses in Boston, Worcester, and Manchester. Baccalaureate degrees in Diagnostic Medical Sonography are offered at the Boston and Worcester campuses. Sonography students complete 1,000 hours of hands-on clinical training across New England. The accelerated bachelor degree DMS program can be completed in three years. The MCPHS fast-track program for applicants with previous college work leads to a degree in 15-24 months. Students can choose from a General Track or Echocardiography Track. The diagnostic medical sonography program at Adventist University of Health Sciences was launched in 1988. Partnered with the Adventist Health System, the university offers a Christ-centered education with extensive clinical opportunities. The full-time track is built on a two year, six-semester program with tracks in general sonography or cardiovascular sonography. Graduates are prepared to sit for the American Registry of Diagnostic Medical Sonographers (ARDMS) certification examinations. University of Arkansas for Medical Sciences, College of Health Professions (CHP) was established in 1971 to offer full degree programs as well as professional continuing education. The Bachelor of Science in Diagnostic Medical Sonography has an annual March 1 deadline for applicants to begin courses in a cohort of 12 students the following academic year. The 120-credit degree program includes 48 semester credits of prerequisite studies. ARDMS-certified sonographers can complete the degree without any required clinical rotations. Upon completing the degree, graduates can take American Registry for Diagnostic Medical Sonography (ARDMS) certification examinations. Earning your credentials as an ultrasound technician may be the first in many achievements during your academic and professional career. Below is a map that highlights some of the milestones one could accomplish during their career. Took physics and advanced algebra classes. Took classes in obstetrics and gynecological sonography. Worked at a pregnancy center as an ultrasound technician. Earned certification in obstetrics and gynecological ultrasound. Assisted in research for peer-reviewed article about common fetal diseases. Earning your ultrasound technician degree online is a great option for those who desire flexibility in their academic schedule. While online programs are less common, many schools are beginning to offer at least a portion of the required classes online. Online ultrasound technician programs require a mix of classroom and clinical time if you are pursuing your associate degree. Due to the nature of the skills needed as a practicing technician, hands-on experience in a clinic, hospital, or specialist’s office is a vital part of the curriculum. Some schools offer bachelor’s degree programs entirely online if you are already a certified sonographer. Because prior work experience can count toward the clinical requirements, students can complete the classroom components online while continuing to work in your field. When preparing to begin an online ultrasound technician program, consider how well you are able to manage your time in order to complete online assignments, as well as your availability for in-person labs and clinical requirements. Research what online or on-campus resources are available for students in the program so you can connect with peers and instructors for any additional support you may need. Reliable access to the internet is also important to ensure you can participate in online discussions, log in to any university portals, and submit assignments. The type of program you decide to pursue depends on the time available for you to dedicate to your education, and how you would like your professional career to advance. Most employers require an associate degree as the minimum education level when hiring ultrasound technicians. While there are additional opportunities for those who want to earn their bachelor’s degree, one can begin building a successful career with two years of school versus four. One-year training programs are available to earn an ultrasound technologist or diagnostic medical sonography certificate. Some employers do accept this as sufficient education to work as an ultrasound tech, but this option is generally recommended to those already working in the health field who are seeking to increase their skillset and marketability. Certificate programs usually focus on an advanced understanding of specific areas of study such as cardiovascular or obstetrics. Associate degrees are the most prevalent degrees in this field and make up the majority of the 150 accredited ultrasound tech programs nationwide. This type of degree is the one that most employers require, especially for entry-level positions. Some colleges and universities only require a high school diploma as a prerequisite but others may prefer students to have taken a few introductory credits related to biology, medical terminology or physics. Be sure you understand the prerequisites required before you apply to an online school. The types of classes you can expect to take include anatomy, physiology, patient care, and medical ethics. In addition to online coursework, students should also be prepared to dedicate time in-person for labs and clinical requirements. Bachelor’s degree programs in medical sonography are less common that associate degree programs, however a four-year degree can be worthwhile for some. Those with a more advanced degree may find advantages down the road as they pursue career improvements or seek to expand their skills outside the diagnostic environment. If your professional goals include moving into a director role or becoming an educator of diagnostic medical sonography, or if you are thinking of going to medical school down the road, then a four-year degree may be your best option. These programs are generally open to those who have already completed an associate degree. Admission requirements do vary and some schools may allow you to start from scratch or consider the completion of another two-year allied health program sufficient. When comparing both online and traditional schools, similar coursework will be found among ultrasound technician programs. These will include a combination of math and science classes, courses focused on specializations such as vascular or abdominal sonography, as well as a humanities curriculum. Below is an overview of common courses you can expect to take during your academic career. This course is a comprehensive study of the anatomy and physiology of the human body. Curriculum in this class focuses on all major systems as they relate to health, disease, and healthcare. Students will learn concepts of ultrasound physics, frequency, velocity, image optimization, and more. They will also learn how these concepts are applies to instrumentation controls, digital signal and image processing, and image quality. During this class, students will examine the fundamentals of word analysis, specific to terms used to identify body systems, and emphasize the spelling, pronunciation, and definition of common medical terms. This course covers general disease mechanisms with an emphasis on the disease processes within the body. Since ultrasound technicians work closely with patients, physicians, and other medical staff, good communication skills are vital to your success. Most programs require a basic communication course that emphasizes the skills necessary to communicate effectively in a variety of situations including interpersonal communication, small group communication, and public speaking. Make sure the schools you are considering have earned accreditation by the Commission on Accreditation of Allied Health Programs (CAAHEP). Does the program meet the standards of the American Registry of Diagnostic Medical Sonographers? Determine which certificate or degree makes the most sense for you in terms of the time you have to dedicate to your education and how you would like your career to advance. And remember, you can always go back later for additional certifications or a more advanced degree. Understand the necessary pre-requisites required by the programs you are considering, including GPA and whether credits you have already earned will transfer. Does the program allow you to specialize in a particular area of sonography such as vascular, cardiac, or obstetrics? Are there in-person elements to the program, such as labs or clinical rotations, and will these be feasible with your schedule? Find out if the school offers additional resources such as support services or career counseling. Ensure you qualify for financial aid and that the school accepts the aid you will be receiving. Graduation from an accredited program is one of the first things a potential employer will look at when considering a candidate for a position. An institution’s accreditation ensures that certain standards have been met in terms of administration, resources, faculty, and facilities. Accreditation among health-related disciplines is also an assurance that a qualified workforce is providing healthcare services. 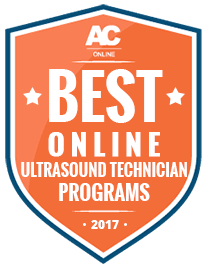 The first thing to look for when you begin comparing online ultrasound technician programs is that they are accredited by the Commission on Accreditation of Allied Health Education Programs (CAAHEP). The CAAHEP is the largest programmatic accreditor in the health sciences field. Through their 23 review committees, the CAAHEP currently accredits more than 2,000 educational programs in 28 health science professions. As you consider a career as an ultrasound technician and research online schools offering this program, it can be helpful to outline the necessary steps leading up to when you will begin classes. Making a list of key dates will ensure that you are prepared and don’t miss any deadlines. The following list maps out a few of those necessary steps to starting an associate degree in ultrasound tech. Before your classes begin and while you are working toward your degree, there are additional things you can do to prepare for classes and your career. Take math and science classes in high school, especially advanced algebra, physics, and biology. This will not only better prepare you for your college curriculum, but also ensures that you have a strong interest and aptitude in these subjects. While in school, seek job opportunities in a healthcare organization so you can become familiar with the work environment you may experience upon graduation. Take additional communication or business classes to better prepare for the non-clinical aspects of the profession. As you near graduation, research and begin studying for certification exams such as those offered by the ARDMS. Consider specialized certification courses you can take post-graduation. Join a professional organization such as the Society of Diagnostic Medical Sonography (SDMS) which will allow you to network with other professionals and stay abreast of continuing education opportunities and other resources. Maintain your Basic Life Support certification since most employers will require this of prospective candidates. Upon graduation from an accredited program, additional professional certifications are available to ultrasound technicians. While these certifications may not be required by prospective employers, they can set you apart from other candidates. This certification promotes best practices for enhanced patient safety within the field of diagnostic medical sonography. Specific to those in the cardiac sonography field, this certification promotes patient safety in cardiac sonography. This credential assesses the competency needed to perform vascular sonography scans while promoting public safety in vascular ultrasound. This certification ensures a basic musculoskeletal knowledge and skills required in making reliable diagnosis and performing invasive procedures in musculoskeletal-related conditions. Additionally, the American Registry of Radiologic Technologists (ARRT) offers certification in sonography, vascular sonography, and breast sonography. The exams consist of questions about patient care, physical principles of ultrasound, and relevant sonographic procedures and competencies for each certification. If the idea of working in the health industry appeals to you but a career as an ultrasound technician doesn’t seem like quite the right fit, there are several other career paths available. Here are a few other programs with similar curriculum and growth potential. Working alongside pharmacists, pharmacy technicians prepare drugs for prescriptions, organize inventory, and explain reactions or possible side effects to customers. If you are attentive, organized, detail oriented, and have an aptitude for math, a career as a pharmacy technician could be a great option. Veterinary technicians assist veterinarians by performing a wide range of skills including radiology, pre- and post-surgical care, anesthesia, and client education. Career opportunities are available in private veterinary offices as well as with humane societies and veterinary supply sales. Medical assistants work closely with physicians and other medical staff to perform tasks such as taking patients’ vital signs, managing medical records, working with insurance billing processes, and more. The job outlook is quite good for medical assistants with growth anticipated at 29 percent by 2022.